So glad you enjoyed the tutorial on mass production HST. Some of you expressed a fear with working with the bias on the outer edge of the square. There is really nothing to fear at all. It's not any worse than the other method. Do give it a try! Thank you for the starch suggestions. Vicki from Field trips in Fibers provided a link to her own starch recipe. You can view it here. If you are acquainted with Vicki, you know it's been tested and it works! ;o) I plan on making a batch as soon as my other starch is gone. Thank you Vicki! On the quilting front.......Have you seen this new book by Tara Lynn Darr - Simply Charming Small Scrap Quilts of Yesterday? It's a great book for using all of your scraps. Since I am not a scrap hoarder, the book provides me with lots of inspiration! Often, I will think or look for a project to use my left overs. Don't get me wrong, I do have a scrap drawer! But what's in there are fabrics that I will want to use again, real soon! When I am not attached to a fabric, in a box it goes for donation to a worthy cause! That's how I clean out my stash to make room for fabrics that are more me! You cannot imagine how liberating that is! Why hang on to fabric that is not your taste anymore? The pattern is called Grannie's Scrap Box quilt! I'm so glad that my small pieces found a home in this cute quilt! Thank you for stopping by! Keep well! Cheers! 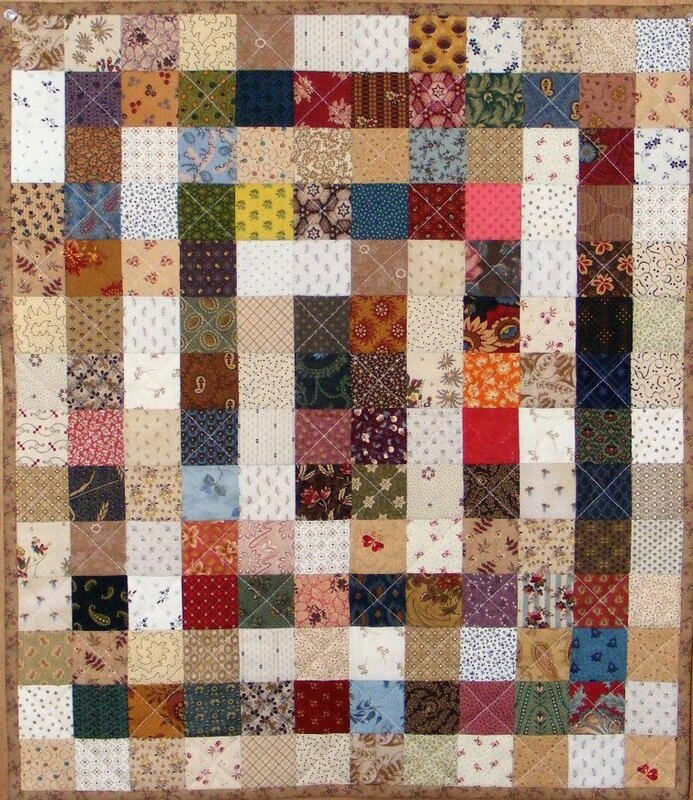 That is a great quilt for scraps. I usually take small pieces and make doll quilts. Tara's book is so good, isn't it? I love the scrappy squares quilt that you made, so simple in design, and so charming! This look like a wonderful book. Love the Grannies Scrap box quilt. Thank you for purchasing my book and your kind compliments! Your scrappy quilt is adorable! Enjoy! Such a darling scrappy quilt you have made!! I love this book, and have ordered it...can't wait! I save scraps but don't often use them, but just when I think I should get rid of them I do sometimes dig into them and find just what I need. Carole, One more comment to leave ..... THIS is the year I hope to finally make the chicken quilt. I had to hunt for the pattern as I had safely stowed it away for safe-keeping. My goal is to make it and have it completed by this time next year to enter into my local guild's quilt show. I just wanted to thank you again for the pattern that you gifted me so long ago. I am eternally grateful. Scraps make me stressed, I always feel I have to use it for something, still don´t throw it away, arrrrrg, silly me.